Non-greasy. Soothing fragrance. 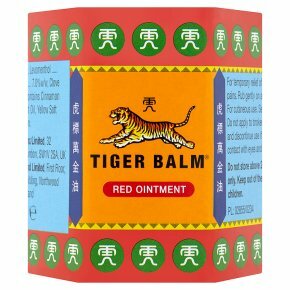 Effective herbal relief from aches and pains.Tiger Balm Red is a proven, safe and effective herbal ointment which helps soothe sore and aching muscles. Tiger Balm Red can be used by adults and children over 2 years. Rubbing the balm on the skin at the painful area stimulates the circulation and causes a warming sensation to provide relief from aches and pains. For temporary relief of muscular aches and pains. Rub gently on affected parts of the skin. For cutaneous use. See leaflet for further details. Do not apply to broken skin. Consult a doctor and discontinue use if irritation occurs. Avoid contact with eyes and mucous membranes.<br><br>For external use only. Keep out of the reach and sight of children.